Basham’s Party Pink Crapemyrtle is a 1965 Lynn Lowery introduction. This Crapemyrtle has bronze leaves when young but these mature into a dark green color, foliage will then turn a orange red color in the fall. The flower is a light lavender-pink color and is borne late spring to early summer. Basham’s Party Pink is a hybrid between Lagerstroemia indica and L. fauriei and was breed for tolerance to powdery mildew and aphids. 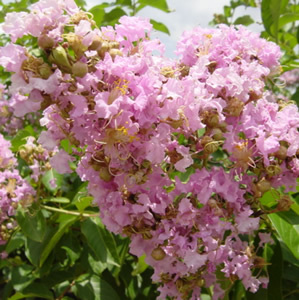 Lagerstroemia indica x fauriei ‘Basham’s Party Pink’ is a larger Crapemyrtle and can get up to 20-40 feet high at maturity.